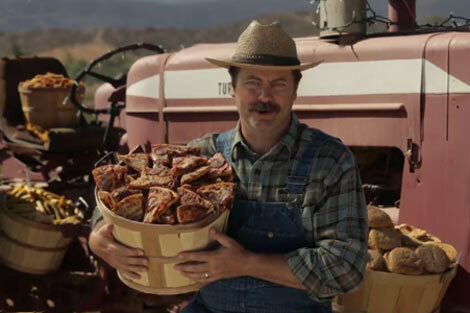 In this clever American Heart Association-sponsored video, Ron Swanson picks vine-ripened pizza and digs up sloppy joes from the earth. Somewhere in the world, Jamie Oliver is cringing at the thought of vine-ripened pizza farm and taquitos that grow on trees. The farm aims to give children the “healthy futures they deserve.” You can find “hot, moist sloppy joes” year-round, and french fries that are “basically considered to be a salad.” The pizza, burgers, and other “crops” are watered with Coca-Cola, obviously. Much of the food that is served to children in schools is heavily processed and full of fat, sugar, and salt. The video from The American Heart Association encourages people to reach out to Congress for the reinstatement of the Healthy, Hungry-free, Kids Act of 2010, which will serve to set stronger nutrition standards for schools. The video is a great step in the direction of encouraging the public to move towards a healthier country. All that being said, we wouldn’t mind a pizza tree in our backyard.